Iced coffee is all the rage right now, specifically cold brew. While it was pushed from the sun for some years due to the influx of quicker (and many would still argue better) brew methods such as the Japanese style (Counter Culture has a nice tutorial) or similarly, the Aeropress over ice (CoffeeGeek advises here), it seems cold brew has vaulted back into the limelight due to a host of factors. And regardless the reasons for its rise back to power, cold brew coffee can be found on the shelves of supermarkets and minds of more people than ever. 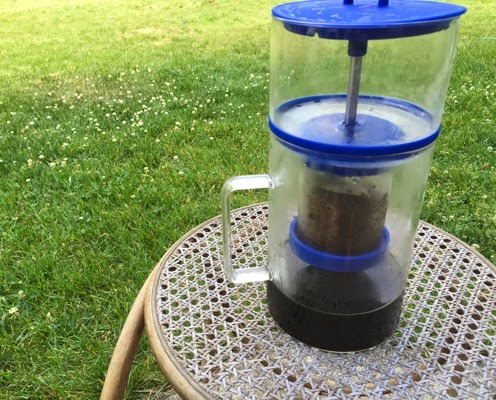 One challenge for the cold brew faithful is efficiently and simply brewing it at home. Truth be told, there are tons of variations on the basic formula of extended infusion of cold water and coffee grounds, sometimes going as long as a full day. Some use full immersion (aka dump grinds into the water, let sit and separate at the end) while others incorporate the slow drip method, allowing passage of cold water through grounds filtered into a waiting receptacle. Of the latter method, until recently a cold brew tower was the only way to get your iced coffee without concocting a Rube Goldberg machine. But cold brew's rise in popularity has brought new brewers that take up much less space and produce the same beverage. The most heralded of slow drip cold brewers that I've seen has been the Cold Bruer, a sleek glass contraption that utilizes the slow drip method in the convenience of your refrigerator. There are two major glass components: the pitcher that catches the resulting brew, and the glass tower that holds the coffee in the lower portion and the awaiting water in the upper. 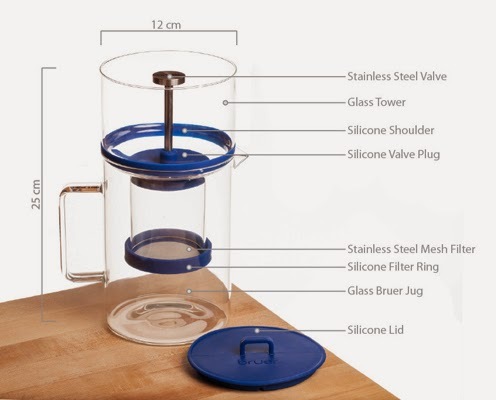 The glass tower has a wonderful "silicone shoulder" (aka a silicone footing on the base of the tower) which minimizes glass contact and keeps the two components well-fitted, allowing for ease of movement in moving the Bruer around. The fitted filter at the base of the glass tower also proved very snug, easy to remove/reattach and extremely effective in filtering out any particulates. Paired with the paper filter on the top of the grounds, every brew was smooth and free of noticeable sediment. Regarding the silicone valve plug (the sole partition between the water reservoir and the awaiting grinds) I found it effective albeit a little cumbersome. While I never had problems with the seal, the plug appeared often like it was not correctly in place, causing me to obsessively check the plug before brewing. Also, the attached stainless steel valve (the part that controls the drip rate) was not very intuitive, making constant reference to their Brewing Guide a must, and even then the drip proved a little tricky to control at times. My favorite thing about this contraption was the time versatility. You could brew as quickly as four hours or as long as twenty-four (if you so desired). And for other variables, one could switch it up by using a hot bloom or even using it for iced tea (check out the Cold Bruer Brewing Experiments page). Volume was one area of limitation. Since cold brew is pretty refrigerator stable, many folks like to brew big batches. And while I laud its ease of fitting in my fridge, a limit of 20 ounces of cold brew seems like a draw back for folks looking to stockpile. Also if you live in a multi-coffee drinker house, 20 ounces will not stretch. All together, I enjoyed the Cold Bruer. It had a lot of great qualities and made a good cup of cold brew when properly utilized. If you seek a sharp-looking brewer that utilizes a slow drip method, check out the Cold Bruer. note: brewer was provided free of charge and the above review is objective feedback. I've been using the Cold Bruer for a year and agree with all of your comments about it. Spot on review! I've been thinking of buying Cold Bruer for a while now. However, I'm was bit hesitant that it might not give me the satisfaction that I always want from my coffee. Thanks for your review, I think it helped me make my decision to give it a go!